The use of fish meal and fish oils by aquaculture are the limiting factor for future growth and sustainability of the industry. 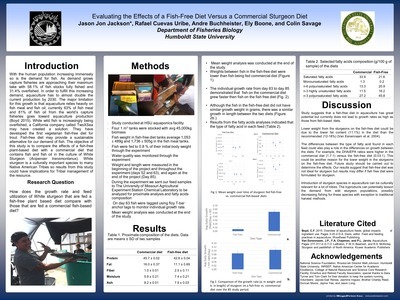 The objective of this study was to evaluate the effects of a fish-free diet versus a commercial diet by evaluating growth and feed utilization in White Sturgeon (Acipenser transmontanus). 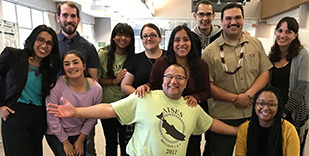 An 11-week feeding trial was conducted in an aquaponics recirculating system with 1.5-year-old sturgeon. All tanks received the same amount of feed each day (360g) throughout the experiment, corresponding to 0.8% of their initial body weight. Two tanks were fed a commercial sturgeon diet (Skretting) which included fish meal and fish oil, and the other two tanks were fed a fish-free diet (TwoXSea). Fish were tagged to monitor individual growth rate and water quality was monitored weekly. Average daily growth between fish in the fish-free diet were lower than fish being fed Commercial diet.